Is Steven Moffat good news for Doctor Who? It's great news. He's one of the few writers who love and understand the show as much as RTD [Russell T Davies]. A darker person in charge, combined with all the rumours that Tennant might be leaving ... Not that I want Tennant to leave. I think he's great, and I'd love to see him play the Doctor darker than RTD lets him (as anyone who's seen some of Tennant's theatre or other TV work can probably agree with). But the possibility of a different actor — older, angrier, scary — hmmm ... Now that's all very likeable. I love it when Who gets a tiny bit too serious or dark for a Saturday tea-time slot. What's exciting about a new showrunner is that we really don't know what he'll do with it. Having listened to Moffat's thoughts on the show, I don't envisage some radical change of direction, but a new hand on the tiller will inevitably keep things fresh. That is needed — not through any fault of RTD's, but just because any one person's vision is bound to repeat itself after 50 episodes or so. Luckily, everything about Doctor Who is built on the possibility and desirability of change. It's certainly true to say that RTD's Who scripts have been more concerned with emotional truth, and Moffat's have been more intellectually/narratively complete, but I'm not sure that necessarily means that's how the series is headed. Moffat is adored by many Who viewers because he has always been in a position where he gets to write the rare scary, powerful episode for the series. Putting him in charge doesn't mean we'll get a whole run of those, just that the dialogue for the 'running down corridors' ones won't be quite so bad. Huge Respect to RTD for the renaissance of Whomania on our screens. The man has done a great job. APA 6th ed. : (2008-05-26). Is Steven Moffat good news for Doctor Who?. The Guardian p. Media. MLA 7th ed. 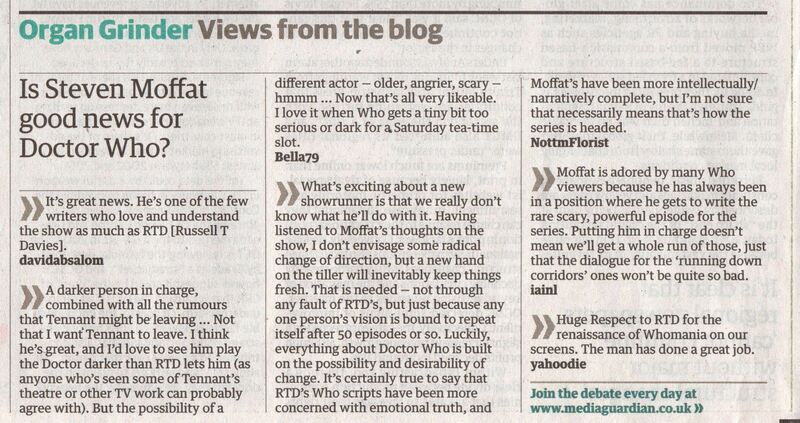 : "Is Steven Moffat good news for Doctor Who?." The Guardian [add city] 2008-05-26, Media. Print. Turabian: "Is Steven Moffat good news for Doctor Who?." The Guardian, 2008-05-26, section, Media edition. This page was last modified on 12 October 2016, at 22:45.